Product typology: the umbrella – available both in long and mini versions – shall be customised through various elements that will contribute to make it a highly distinguishable product for the final user. Customisation elements: in order to make the umbrella an iconic product, you may include various customisation elements, including for example the ones listed below. For more info about the current product range and for some examples, please see the Material files attached and the website www.perletti.com . For the purpose of the contest, you may focus even on one single customisation element. •	Handle: usually available in various shapes and styles, both for the long and mini versions, it is one of the most important elements in the customisation of the umbrella. The handle leaves space to various customisation possibilities that you are invited to explore as you prefer, for example in the choice of materials, finishes (soft touch, carbon finish, pearlescent, iridescent, rubber, etc. ), shape, juxtaposition of materials or other processes. In addition to the style requirements, keep also into consideration the ergonomic features of this element, to offer both great aesthetic value and good usability for the final user. •	Tips: end elements of the ribs where the canopy is fixed; they are another element for your customisation of the umbrella. You are free to give them shape and colour at your discretion. •	Top: depending on the umbrella typology – long or mini – there’s a top element, that you may consider for customising your umbrella. •	Ribs: they are currently made of fibreglass, iron or aluminium mainly – for instance, they may be customised in the colour or in the design of the joints. •	Case: it is a very characterising element, giving the fact that – in addition to the handle – it constitutes the visible part when the umbrella is closed. •	Closing strap: you are free to explore new solutions to make it a very charactering element for your umbrella, also exploring at your discretion the use of different materials (ex. fabric, cords, chains, etc.). •	Canopy: it is customised through graphics, colours, patterns, solid colours, etc. •	Other elements or accessories: at your discretion, you may suggest the use of other customisation elements such as labels, pendants, etc. to make your umbrella really unique and distinguishable. In addition to the elements described above you may suggest other elements or customisation solutions that make your products a really distinguishable product for the Perletti brand. Style: you are free to adopt the style you prefer, even in discontinuity with the current stylistic language used by Perletti. At all events, your umbrella shall be designed for the city and be perceived as a dynamic and modern product, which favours clean lines. Shapes: you may suggest innovative shapes for the various elements, still keeping into consideration its ergonomic aspects and in view of its industrialisation. Size: the new umbrella shall comply with the standard for this product typology, both for the long and mini versions. You are invited to take into consideration also the proportions between the various elements of the umbrella (for ex. handle size vs the overall umbrella dimensions, etc.). For more details, please refer to the Material files attached and to the collections available on the Perletti website. Materials: you may suggest the use of various materials (for ex. ABS, PVC, metals, etc.) including finishes (soft touch, carbon finish, pearlescent, iridescent, rubber, etc.) or various material combinations. You are nevertheless free to suggest possible innovative solutions, always in view of the product industrialisation. For some examples about the materials used by Perletti, please refer to the Material files. 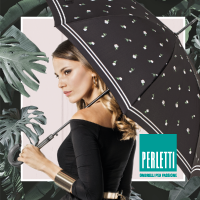 Values to convey: your umbrella shall be perceived as a very recognisable, original product, able to constitute a very distinguishable element in the market, thus becoming an iconic product for the Perletti brand. Logo: for the purpose of presenting your project, you may include the Perletti logo in a discreet way, using one of the versions provided in the Material files. Deliverables: upload all the images that better present your projects, giving maximum visibility to the customisation elements you suggest. If necessary, remember that you can also attach a .ZIP archive containing extra materials. Participation is free of charge and open to designers and creative talents of any nationality aged 18 years or older. Participants can present one or more projects, but only the projects published on the www.desall.com web site, via the upload page related to “Your Umbrella, Your Perletti” will be accepted. The selection of the winner by Perletti will be the result of an unquestionable evaluation and it will take into account originality, feasibility and consistency with the brief presented. For the duration of the option right, the Sponsor offers an extra chance to all participants setting a fee of Euro 2,000.00= (two-thousand/00) for the purchase of the license for the economical exploitation of the projects not-acknowledged as the winning proposals. Do you want to stay updated about "Your Umbrella Your Perletti"?